This is the third (and my favorite album) from Scanner. This third album also features the band's third lead singer. After the band's relationship soured with Terminal Earth vocalist SL Coe, guitarist Axel Julius was faced with the prospect of recruiting another vocalist for the band. Enter Haridon Lee for this album and for the subsequent release, Ball of The Damned. As the band underwent yet another vocalist change, they also underwent a makeover to their sound. 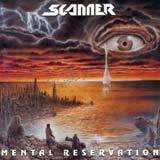 After releasing two science fiction / outer space themed power metal albums in Hypertrace and Termial Earth, Scanner dropped both the sci-fi theme as well as the straight forward power metal approach. Instead, Scanner went for a more thrashy approach which was largely due to Axel Julius' desire not to stagnate the band's sound and to demonstrate the influence old school thrash bands (mainly Metallica) had on Axel Julius. The result is simply masterful. The voice of Haridon Lee is a major reason why Mental Reservation is a true masterpiece in my eyes. He has the range to hit and sustain the high notes during the chorus lines and can reach down into the lower range in some spots such as the second track, Upright Liar. More importantly, Lee's voice is very clean and melodic which is a great match for the type of music Scanner play. Whether it be the power metal we heard for the band's first two releases, or the thrashy delivery of this album, Scanner has a great sense of melody and thus Haridon Lee's delivery adds even more. The slow paced track, Your Infallible Smile showcases the versatile and emotional vocalist that is Haridon Lee. Lee also shows a fierce and slightly forceful side of himself during 20th Century Crusade. I haven't heard anything from Haridon Lee since 1997's Ball of the Damned, but if he is still active in the metal scene, I'd really like to hear his current band. The music itself is very intense and well done. I'm sure it sounds exactly as Axel Julius envisioned it would. Full of fiercely fast thrash riffs, wild solos and shredding from beginning to end, Axel Julius adds tremendous energy to the songs with his axe work. The drum work on this album is not only well done, but has an exceptionally crystal clear sound. In fact, this album features some of the most precise and clean sounding drumming I've ever heard, especially for the time this album was released. Of course, the excellent production is as much to credit for this as is drummer D.D. Bucco. Speaking of production, each instrument is turned to the right level and the backing vocals compliment Haridon Lee perfectly to make the songs even more memorable. The ingredients of thrash influences, lots of solos and fierce riffs, precise drumming, and high quality vocals mixed with an overall strong sense of melody create a simply fantastic album that belongs in every metal collection. If you are unfamiliar with Scanner, I recommend this album as a starting place as I feel that this lineup and musical direction made for the best chemistry in the band's history. Fans of more straight ahead power metal might want to check out Hypertrace also as many fans consider that album the band's best work. Or better yet, acquire all five (especially the first four) albums of Scanner and you will see what a truly great but underrated band they are for yourself.